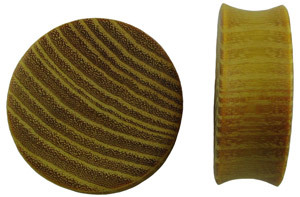 Osage Orange Hardwood Solid Plugs have a slightly curved saddle wearing surface for a more secure fit. The hard wood has an extremely fine grain that allows for a perfectly smooth and polished finish. This beautiful set of lobe plugs are unique and eye catching. Rather than mass-manufactured, this naturally occurring Osage Orange Hardwood was masterfully crafted by hand in the U.S.A. Wood color shade and patterning may vary from piece to piece in a pair and from the piece shown in this image. Actual size of plugs may vary up to approx. 1/64 of an inch. Other gauge sizes may be available, Contact Us for more information.